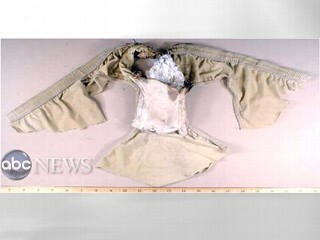 These pictures of the Underwear apparently the bomber was wearing. As someone pointed out at the top and center of the first picture of the underwear it does look a lot like tin foil as does the pakcet whhich has been removed from the second. Looks like there was no fire damage to his underwear either. There are more videos and links to more information at the Source as well be sure to check them out. The same Security company involved in 9/11. Well isn’t that just a coincidence? So again Israeli airport security is involved. ICTS on all three occasions ???. Like 9/11 someone was video taping the event. I bet it turns out to be an Israeli yet again. Who was doing the video is yet to be known and we may never know. If it were Mossad or other Israelis like on 9/11, well Israel forges passports, so who the actual person doing the video tape really is, is definitely to be questioned and fully investigated. I guess the FBI will have to do some real digging to find out. I can bet the Airport security will be of little help however. Seems they are in on the crime considering they helped this event happen. Was Abdulmutallab brainwashed to do this. Probably. Anyone can be brainwashed to such a deed even you. Should we all be superstitious most certainly. What Fox news is feeding the masses. But if you are going to strip search one group of people, then you must strip search everyone. Equality you know. Personally this a ridiculous idea and bigoted to say the least. It was Chertoff (Israeli/US Duel Citizen) who in 2005 initiated the purchase of the first batch of these ‘Made in Israel’ scanners – five from California-based Rapiscan Systems. Currently, 40 full-body scanners are use among 19 US airports. The fear created by Zionist-controlled mainstream media after the failed Christmas Bomber false-flag operation is expected to skyrocket the numbers of these full-body scanners. And that’s the reason why this Israeli parrot is singing so loudly, because not only his own company, the Chertoff Group, but also will provide more opportunities for Israel to carry-out more false-flag operations involving phoney Muslims. And how lucrative this business is – well, Canada’s Transport Minister, John Baird, has announced that Ottawa is purchasing 44 of these machines at the cost of $11 million. 7 others may have been arrested after leaving Gaza . Still no news on them however.